In making boxes and box-lids, as well as many other articles from sheet material, rabbetting is a very frequent operation, and since this is a rather difficult operation to perform with any degree of accuracy with ordinary hand-tools, the following simple gadget should be made up for use under such conditions. The purpose of the rabbett is to form a groove around a square edge, permitting a box-top to set down into the top of the box slightly, in order to keep it from sliding off, and the rabbett is seldom more than 1/8" deep either way. On rare occasions it is set back from the edge, but as a rule is directly on the corner. All that is needed to make a device to do this work is a means of fixing a tool in the proper position, and a means of guiding the work properly against this tool. The tool can be a file, ground to the proper point, a piece of hard bronze, or a lathe-bit. The guide is a block of wood or any other material, and by screwing this flat to the top of the bench, and clamping the tool firmly under one end of it, you have the equivalent of a shaper. The tool projects about 1/8" from the edge of the guide (or less for the first few strokes) and the work is pushed back and forth, the tool taking a shallow cut at each pass, while the work is held firmly against the guide. The tool-angle must be carefully determined, so that it will not "dig in" and rip the work, being a few degrees less than a right angle as it approaches the work. This assembly is illustrated in Figure 31. Fig 31. Device for cutting- shoulders on box-lids. The sheet stock is laid list on the bench snd poshed back end forth across the tool-point, making a light cut at each stroke. Figure 22, No. 3 is a combination penholder-letteropener, which can either be made by hand or on a lathe, in which latter case the design is slightly different. If working entirely by hand, the three pieces shown in the sketch right are jig-sawed out of 3/16 in. sheet, the two short pieces cemented on either side at the lower end of the pen-holder, and this end is then ground or filed to the round shape, and the handle then shaped. The hole for the nib is then drilled, of a size to fit the metal parts taken from any pen-holder. If a lathe is available, the handle can be made from a piece of rod, lathe-turned to shape, with the nib-hole running clear thru. The stem is then filed to a round point and cemented into this hole. Figure 22, No. 2 is a carved dress-dip, maple-leaf design, jig-sawed out of 3/16 in. sheet. The design is first cut out of paper or cardboard, and then traced on the sheet as many times as it will go—in this case 12 times, and then jig-sawed out. While this design looks extremely complicated, it can be easily worked out with an ordinary 3-corned file, as the surface of the pin is filed so that it curves up from the edge to the center, permitting the use of the straight-edged file on all portions of the design. After file-carving to shape, sanding, buffing and polishing, holes are drilled in the back with a No. 55 drill, and the spring-hinge dress-clip fastened on with 3/16 in. drive-screws. "Findings" and their attachment are described in Chapter 11. The design of the pin, of course, is subject to infinite variation, even to the extent of working out the school monogram or the pupil's initials. Below this, in Figure 22, No. 4 is shown a series of modernistic dress-clips. The designs shown are merely suggestions —there is no limit to the variations. The initials of the wearer, the school or a club can be worked out in one or more colors or various geometric shapes used singly or in combination. Every scrap of left-over material can be utilized in some odd combination of colors and shapes for dress-clips. Elsewhere herein will be found a number of photos of commercial designs, many with intricate carving, which can be adopted for hand-tool work. All of the animal-outline designs in Figures 26 and 27 can also be used as dress-clips, either plain, "inlaid" with enamel-filled scratches, or carved. Materials:1/2 of a 3/16" sheet. 1/2 of a #6 cylinder 3" of 5/8" round rod Sketched in Figure 22 (No. 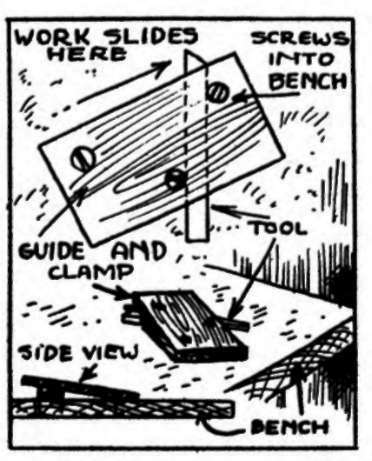 1), and shown in the photo (Plate 2Z) is a very simple design of box which makes up attractively, and requires only a fret-saw and a hack-saw. 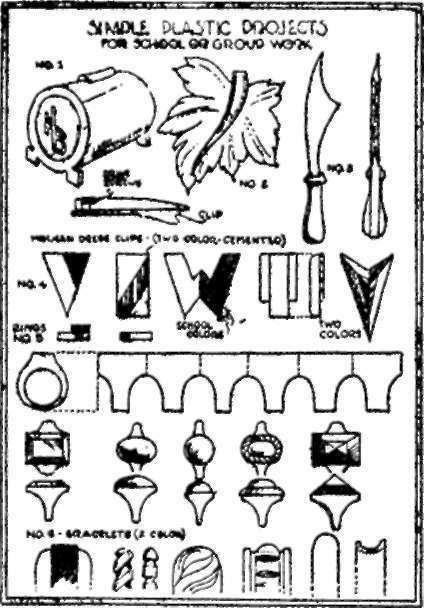 The pattern (Figure 23) below may be traced on the piece of 3/16" sheet plastics, or pasted directly on with rubber cement, and the two ends, the buttons on which the lid rests (and the monogram, if desired) cut out with a hand fret saw or a power jig saw, using a fairly fine blade. Next cut the cylinder into two halves, providing material for two boxes, making sure that this cut is absolutely square. Use a mitre box and a hacksaw, if you do not have a power saw with an accurate cut-off guage. Next make two longitudinal cuts in the cylinder, 120 degrees apart (where indicated at "B" below) for the lid. Make accurate cuts, using a thin blade, and use care not to let the blade slip and scar the surface. The next cut is the handle, from a piece of rod. Flatten the bottom side of the rod slightly with sandpaper to give it a firm seat on the lid. Next cut out your monogram from some of the scrap sheet with a fret-saw or files and a drill. A variation of this cut-out monogram idea is to scratch your initials or some ornamental design and a couple of circles on the ends with a file-point or divider-point, and rub black or other colors of quick-drying lacquer in the scratches, producing an "inlaid" effect. The next task is to flatten the lid out slightly, making up in width the space lost in the two saw-cuts. Heat the lid either by pressing hard on a power buffing-wheel, or by immersing in water near boiling for 2 or 3 minutes, then bend slightly; cool in water or air. Next sand, buff and polish all surfaces except the cylinder-ends and any other part to be cemented. ASSEMBLY is entirely a cementing job, read and follow carefully the directions given with the cement. Cement one end piece to the cylinder first and let it set to harden, in such a position that it will not "slide" while setting. While this is setting, cement the handle to the lid, and one monogram to the other end-piece. When these first joints are set hard, cement the whole together. After the assembly is hard, cement on the four buttons, two on each end inside, just under the corners of the lid, in the position indicated at "A" in Figure 23, supporting the lid level. Use the cement sparingly, cleaning off the excess with a damp rag if it is still soft, or with a file after it hardens. Fig. 22. A group of simple plastics projects which can all be made with hand-tools. No. 1 above is the cigarette-box in Project 3. No. 2 is the maple-leaf dress-clip in Project 2, with additional clip-designs below. No. 3 is the pen-holder in Project 1. No. 6 shows the method of cutting: up an entire ring-tube at once to make six rings, with various designs below. A number of other attractive box designs will be found in various other illustrations, which can be made with hand-tools. Among these is the plain square box made from cemented sheet, illustrated in Plate 2Y, on the top of which any small ornament can be attached as a handle. The ornament can be of metal, or carved from plastics, or any odd-shaped piece of plastics in a contrasting color. Fig- 23. Pattern for the cigarette-box in Project 3. This pattern is cut out of half of a 6"x8"x3/16" sheet. 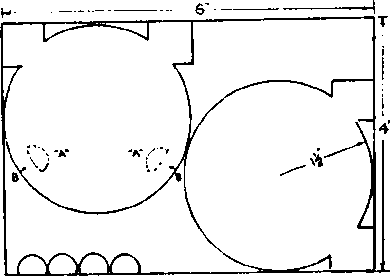 The half-circles at the lower left sre the rests which support the lid.